Ladder3.org Dedicated to our heroes and their families. Letters from families and friends are appreciated. Your photos and stories are welcome and will be posted to this community forum. This web site is a personal project, first created in September 2001. It is not an official site, nor a commercial site, nor a charity. This site was not and is not connected with the former Ladder 3 Assistance Fund. Please note: Five years after 9/11 the Ladder 3 Assistance Fund has been closed. All the funds have been disbursed to the families of the firemen who were lost. We thank everyone for their contributions. This is not an official City of New York or FDNY web site. All information shall not be considered that given by the New York City Fire Department or FDNY. The FDNY acronym is a registered trademark owned by the City of New York. Five years after 9/11 the Ladder 3 Assistance Fund has been closed. All the funds have been disbursed to the families of the firemen who were lost. We thank everyone for their contributions. 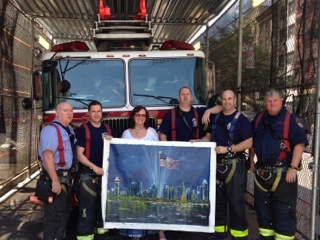 After painting this my dream was to donate it to NYC Ladder 3 !! Thanks for helping make it Happen !! I visited Ladder 3 last month, and there was a reason. Every 9/11 I climb 110 floors in the Denver StairClimb, in memory of the 343. I was given Jeff Giordano’s name and picture, and climbed for him. I wanted to tell the family I did it for him, but was unable to locate it. 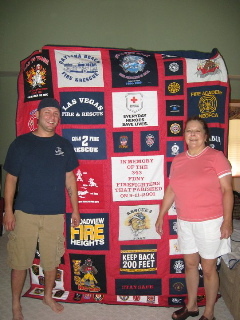 My mother took all my old fire shirts and patches that I had collected for over 10 yrs and made a quilt, which I presented to them on July 25th. Engineer Wind was nice enough to show us around. The air felt a li’l thick, and we felt awkward, but I wanted them to have the quilt. I hope they hung it up. For I couldnt find Jeff’s family, the brothers are the closest I can get. I had so much to say, and for some reason, I didn’t feel it was the right time. Here is a picture of the quilt. October 2007: A new book Miss You, Pat: Collected Memories of NY’s Bravest of the Brave, Captain Patrick J. Brown about the fallen Ladder 3 captain has been published this month. See the Paddy Brown page for more information. September 2006: See the Paddy Brown page for emails from Ireland on the Finding Paddy documentary. My name is Tracy. My husband is a firefighter in Amarillo, TX. I work for a dentist office that often travels to great cities such as New York for conventions. In August of 2001 our office visited NY. I always try to take pictures of anything fire dept related so I can share them with my husband. I was lucky enough to meet some firemen from Ladder 3 during our last night in NY. 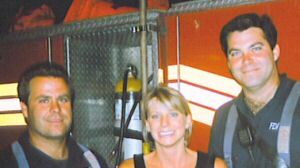 I am enclosing pictures of myself with 2 of the firemen and also one of the truck. 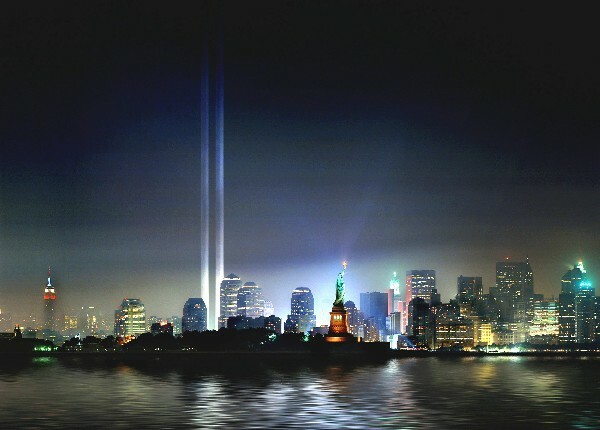 I was devastated a month later when the towers fell. I kept thinking how I was just in the buildings less than a month before and that it was possible the nice firefighters I had met could have been killed in that tragedy. I found a NY firefighter online not long after that and he looked at the pics and assured me that these men were still living. With the 5 year anniversary tomorrow, the attack has been on my mind and all those that were killed especially the firemen. I looked today and saw that many men were killed that worked from Ladder 3. I just want you to know that I am so very sorry that this had to happen and I will always have NY and the fire department in my heart. 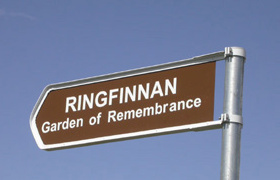 Kinsale Garden of Remembrance is dedicated to the memory of Fr. Michael Judge, Chaplain in the New York Fire Department and to the 343 brave fire fighters, who so courageously lost their lives in New York on September 11th 2001. View back to Kinsale from Ringfinnan The Kinsale Garden of Remembrance was initiated by Kathleen Murphy, a nurse in New York City. She was born in Ringfinnan, Kinsale and her family continue to reside here. The first tree planting ceremony took place in November 2001 and this was followed by an official dedication of the garden on 10th March 2002 by the then Minister for Agriculture & Food, Joe Walsh, T.D. 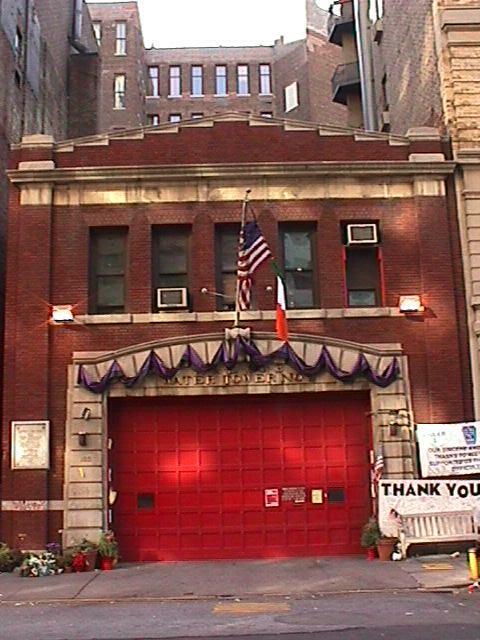 The dedication ceremony was attended by Irish relatives of the deceased New York fire fighters. Many of the fire fighters were of Irish descent and the garden has been visited on a regular basis by United States visitors to Ireland. Attached to each tree is the name of each individual fireman. To get to Ringfinnan from Kinsale, go past the Trident Hotel along the road road running parallel with the Bandon River in the direction of Cannon Duggan Bridge. At the bridge, turn left and go over the bridge, then take a right turn. After 200 yards, turn right up the hill to Ringfinnan following the signpost. IS THIS FUND STILL ACCEPTING DONATIONS FOR THE FALLEN FIREFIGHTERS FAMILIES?—from JS in PA.
We spoke about two years ago and you directed me as to how to contact some of the members of Ladder 3. I am an Active FF/EMT in NJ and my old dept. and I did a fund drive for the Ladder 3 Memorial Fund and then personally took the check to the guys at their station. Some of us wanted to go back and visit the guys again. I met both Capt. Browne, and a FF they called Gonzo. I was hoping you might be able to get me in touch with either of them so that I can schedule another trip into the city. We were very impressed with the guys and they treated us like we raised 10 million dollars for them, even though we didn’t even raise a thousand. If you could give me a contact number I would greatly appreciate your help. Thanks so much! Take care.- from TM in NJ. (CBS) A total of 343 firefighters perished at the World Trade Center. They are American folk heroes now, symbols of heroism and sacrifice. But 12 months ago, they weren’t icons. They were regular guys, commuters mainly, men with mortgages and lawn mowers. What’s also been forgotten is that they were survived not only by wives and children, siblings and parents but by thousands of guys just like them. Other firefighters who made it through that day downtown, or who never got there. Bob Simon reports. 60 Minutes II spent time this past year at Ladder 3, where they lost 12 men—half its members. The planes hit the World Trade Center right in the middle of a shift change and many of those lost from Ladder 3 weren’t even on duty. Eight-year veteran Mike Moran wasn’t working that day, but he wanted to be there. He raced in to the Trade Center from his home in Rockaway Beach but got caught in traffic. Imagine owing your life to a traffic jam. One of the guys he knew and lost that day was his brother John, a Battalion Chief. “I pictured us living side by side in the same neighborhood for the rest of our lives. And that’s—that’s gone now. I do look at it that I was lucky to have him,” Moran says. The nights and the days after the attack became a muddle of searching and talking and crying. Tears shed by men who before Sept. 11 did not do a lot of crying. Steve Browne was the surviving senior officer. “Just waking up every morning and being like—this is not a dream, you know and you have your morning cry and then you do what you gotta do—you know? And before you know the memorials and the funerals started and that was just a whole ’nother thing on its own,” says Browne. The men who died left 16 children behind—16 children and wives, brothers, sisters, parents. Ask anyone who’s ever lost an arm or a leg... For a long time, you feel its still there. That’s how the men of Ladder 3 felt about their lost brothers. “I think about them all the time. I think they pull up in my driveway in a car and they they all are in a car. I’ll be cutting my lawn, be driving, cutting my lawn and I’m thinking about these guys, going through my head—why am I here and they’re gone,” says 15-year veteran Jerry Brenkert. Jimmy Wind spent 20 years at Ladder 3. He says he misses some of the little things, like playing foosball with Timmy McSweeney, a father of two. Mike Moran’s firefighter father died when Mike was a teen-ager. Mike’s brother, John, became his new father figure. And now he was gone too. “I remember him telling me on the phone one night that whenever he closed his eyes. all he could say was ‘I lost my brother.’ That was hard, hearing that from him,” says Peggy Moran, Mike’s mother. Brothers cannot be replaced. But replacements had to be found for the men who died at Ladder 3. There was work to do. Replacements were needed, but not necessarily wanted. “You just kinda kept to yourself in the beginning,” says Jerry Perrillo, a probie assigned to Ladder 3. The remains of only two men from Ladder 3 were recovered by November. With no bodies to bury, they had memorial services for the 10 others—the last one for Captain Paddy Brown. Brown was a Fire Department legend. His specialty: pulling people out of burning buildings. Firefighters heard him reporting on Sept. 11 that Ladder 3 was trying to rescue people somewhere around the 40th floor of the north tower. Moran thought that after that, he could begin trying to return to routine. But the bodies of their comrades began turning up late in November. You simply don’t come out of something like this unchanged. 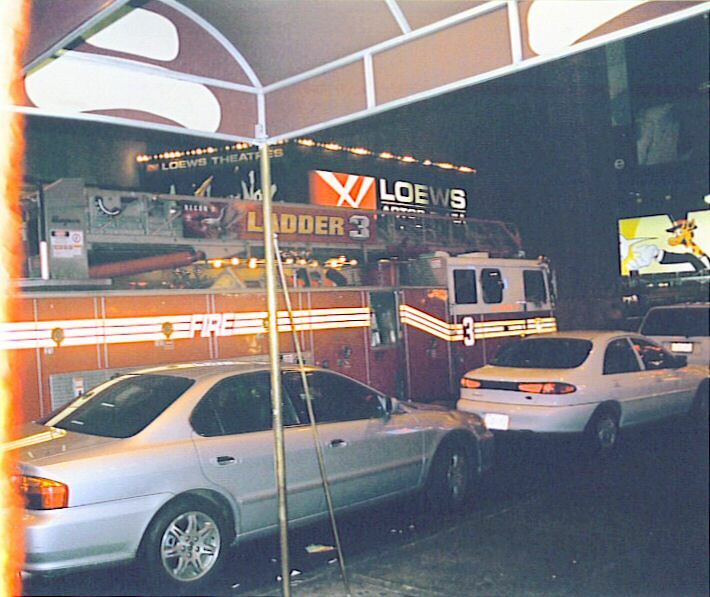 For some of the survivors of Ladder 3, the change was not only psychological or spiritual. Some of the men were moved to change the facts of their lives. “I’ve since separated from my wife, and I’m looking to have a better quality of life for myself,” says Wind. “Now after this it makes me realize how precious life is and what a short time that we have on this earth." 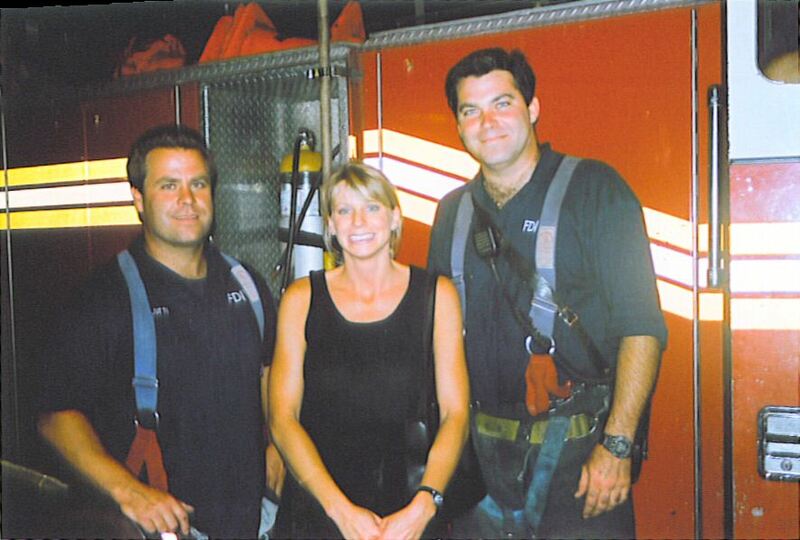 That marriage was the first time in a year that the men of Ladder 3 had gotten together for a happy occasion. And it was, at least in part. “When I danced with my mother, and she said something along the lines of—‘Oh your brother would love this’—and that was pretty much—we were both in tears after that,” says Moran. And then summer came. While grief counselors were still filing into the firehouse, the best therapy seemed to be doing what they’d always done: fighting fires. The guys started paying attention to the new guys, too. Perrillo says that the veterans became friendlier. Brenkert says a brother of one of the fallen firefighters gave him some good advice: "You gotta let it go. I mean, it’s not their fault—it’s not the new guys’ fault. They’re there and these guys are gone." One year after the fall, the heat is beginning to pass. The colors beginning to change. Pat was my neighbor. A quiet guy who always smiled and said hello on the elevator. And if anyone knows a Manhattan apartment building, that was a lot to get from a neighbor. Before 9/11, I’m not sure how many people in the building knew about his legendary reputation as a fireman, I know that I didn’t. He was just “the friendly fireman from 11” to us—the guy who helped a neighbor who was recuperating from a bad car accident, got someone’s car started, gave someone a ride to work, gave a kid a boost to push the elevator buttons, stuff like that. Since last September 11th and particularly since his memorial mass on 11/9, we’ve learned that his good deeds around Stuyvesant Town were nothing compared to what he did in his life. Since last year, I’ve been making a concerted effort to “Do a Paddy Brown” every day so that his legacy will continue. I think going forward, I may even do it as a “Ladder 3” to honor the twelve incredibly special men that were lost. 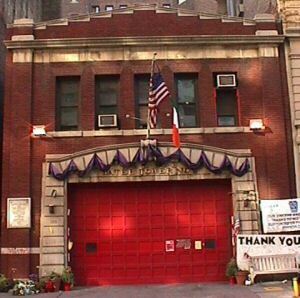 God Bless the twelve men lost on 9/11, their families and the FDNY. We think doing a “Paddy Brown” every day is a brilliant idea—everyone should try it.